The yacht Warrior Won, an Xp44, skippered by Christopher Sheehan of Larchmont (NY) Yacht Club took the main prize, the St David’s Lighthouse Trophy. This silver replica of the islands landmark lighthouse is awarded to the boat in St. David’s Lighthouse Division that is first on handicap corrected time. This division was the largest in the fleet with 110 entries. Read more about this race. 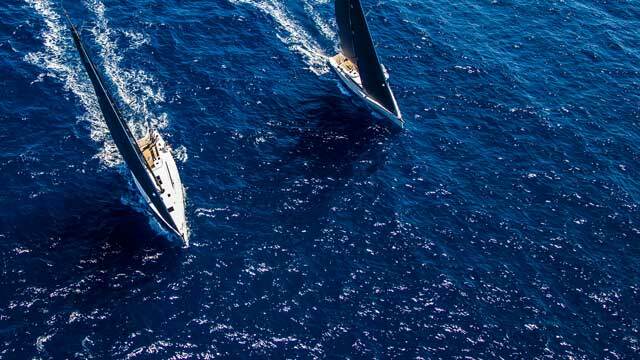 The Giraglia Rolex Cup is one of the most important racing event in the Mediterranean calendar. It combines offshore passage races along with a number of inshore races. This year in the overall combined results for in inshore and offshore races Xp44 Amber Mills took 1st place in IRC-A, This is a great achievement as she is sailing against some of the most famous racing yachts in the world. Thanks to photographer Carlo Borlenghi for this great photo! Congratulations to the crew on board Sitella for winning the 67th “Down the Bay Race”a 120 nm course from Annapolis, MD to Hampton, VA. . Not bad going considering their new Xp44 was only delivered this Spring! Ian Hill and his crew who had never previously skippered an entry in the venerable event, was presented with the Robert M. Ravin Memorial Trophy for fastest elapsed time and the prestigious Virginia Cruising Cup as overall winner on corrected time. Max Gurgel and is crew on board X-Day have come 1st in ORCII in this years Kiel Week. This is one of the biggest sailing events in the world with yachts and dinghies of all ages and sizes taking part. Taking place so close to X-Yachts HQ meant there were a number of X-Yachts taking part in the event., with 5 in ORC II alone!! In winning this event they have also now won the overall German ORCi Championships. This is a remarkable achivment espcially for a yacht that has not been overly optimised for racing. She has the Standard keel, standard rig and standard sails… Just goes to show that the Xp44 is a super competitive boat event without the added extras!